The Marfy challenge was a great success, and students are so pleased with their garments. They cannot wait to make another one, and many of the students have already chosen their next pattern. 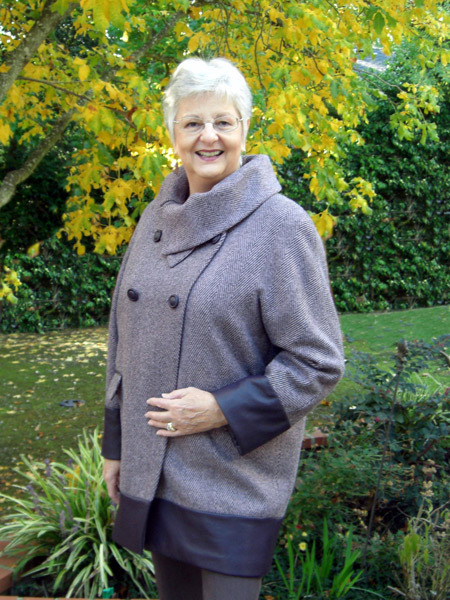 If you missed joining in on this challenge, just talk to Jane and she can help you get started on your Marfy garment. Marfy patterns are made in Italy, and have a lot of style and fabulous details. 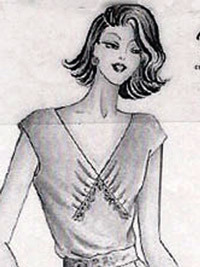 They do not have instructions or seam allowances, so they are more challenging than other sewing patterns. But thankfully Jane's students have access to her wide knowledge bank!! 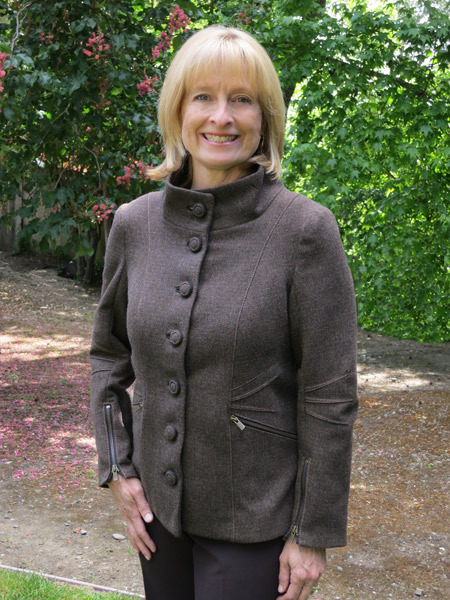 Jane's lined coat is Marfy 2257. She had the wool in her stash and chose to use Ultra leather for the trim from FieldsFabric.com This product can be washed and dry cleaned and is soft and very easy to stitch. Jane is a Marfy size 52 and the pattern was only available up to size 48 so she enlarged it before she made her muslin. She also widened the collar. 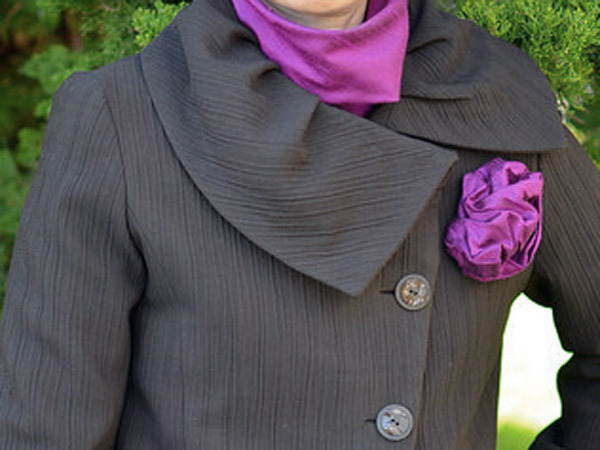 A fabulous collar made with several pleats. 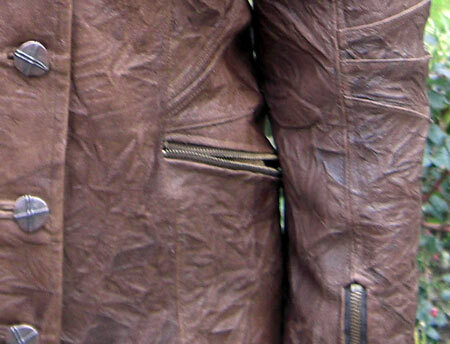 Ultra leather was used to cover the buttons and for the bound buttonholes. 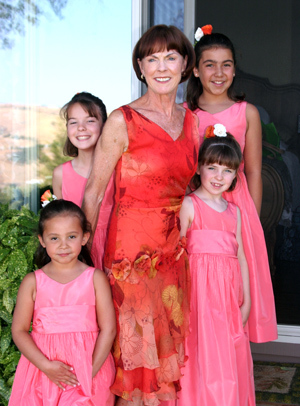 The buttons were covered by Pat Mahoney in Lodi CA. 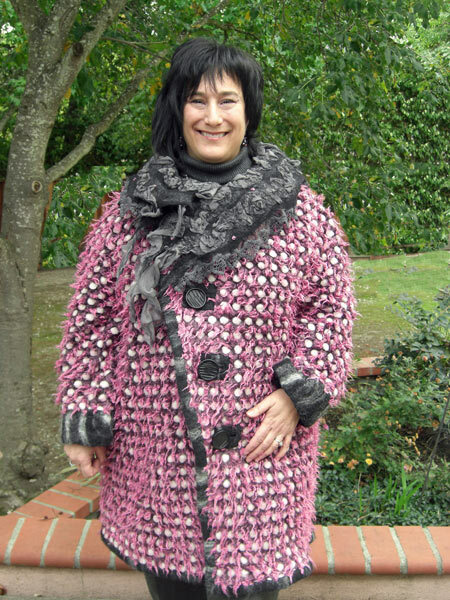 Susie liked Jane's Marfy jacket 2257, and decided to make one for herself. She used a Louis Vuitton fabric she found in Paris. 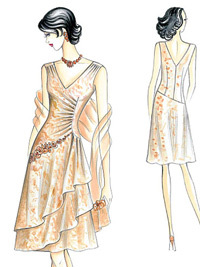 It is a very unusual fabric with a slightly metalic look, and she lined the jacket with champagne colored silk charmeuse. 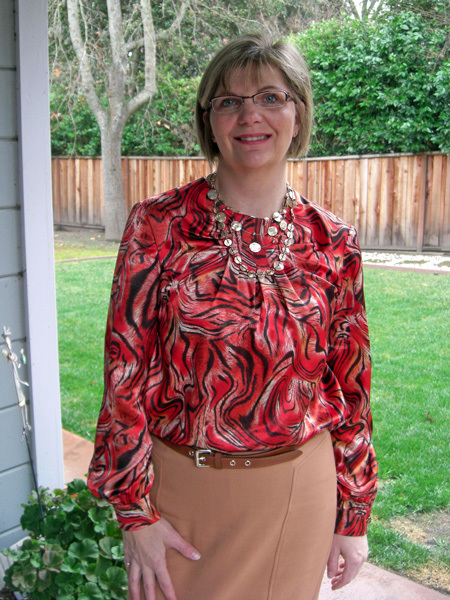 Barbara looks stunning in this striking printed blouse made with Marfy pattern 2559. 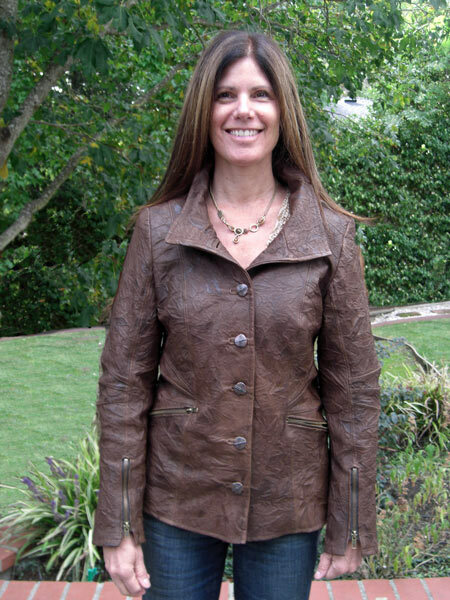 Janice used Marfy 2270 for this leather jacket. 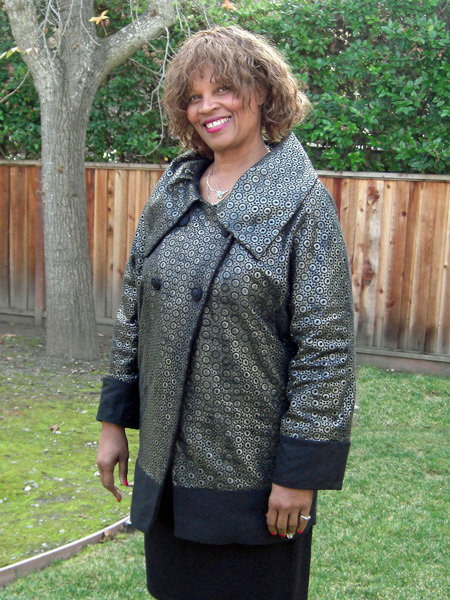 She had several skins in her stash and so created this lined zipper trimmed jacket. It will get lots of love and wear. 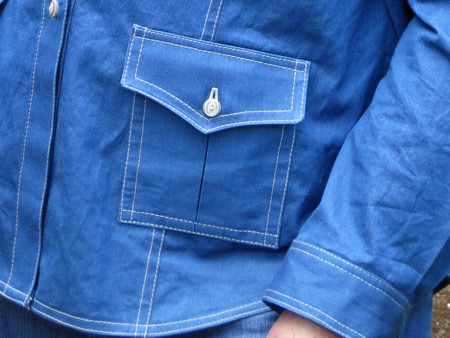 Darts are normally sewn on the inside of a garment, but on this jacket they are sewn and then top stitched on the right side. 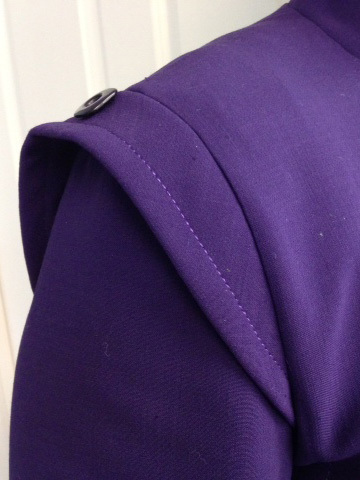 When a sleeve has darts for shaping they are usually at the out side of the elbow, but with this jacket they are on the inner elbow. Janice used a leather machine needle, and instead of using pins she used paper clips. 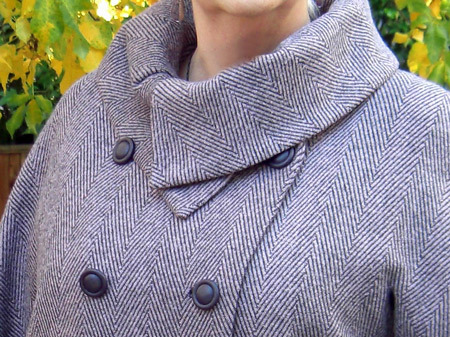 Jasna’s choice was a textured wool from Britex, San Francisco. Her Marfy pattern 2244 has the prettiest collar that frames the face. 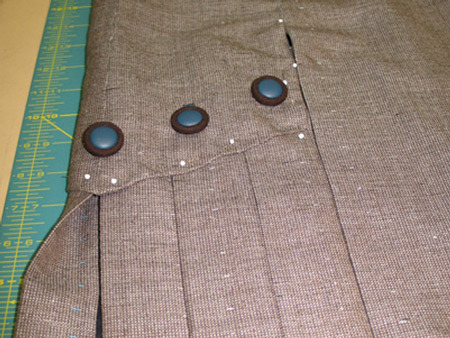 The asymmetric closing is held in place with fabulous buttons and Spanish snap buttonholes. She also made slacks with the same fabric. The finished collar has a great shape. 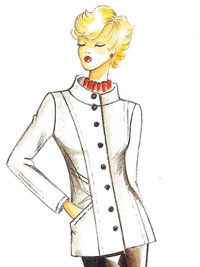 The collar pattern is nearly a straight piece with some pleats, which means it will stand up. The textured wool plus interfacing also contribute to the shape. 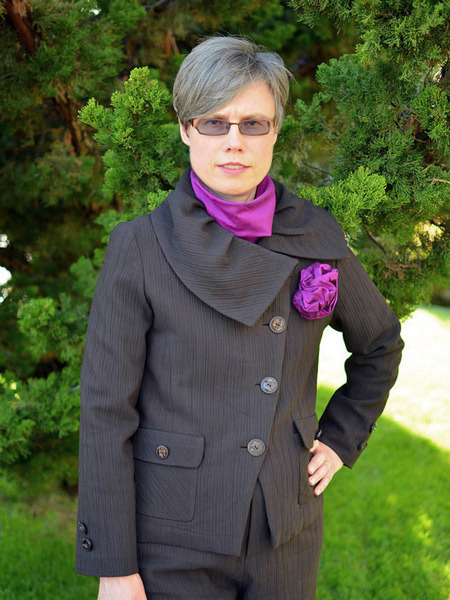 The wide overlap at the front of the jacket gives the collar more length than usual. Jasna made many samples of the Spanish snap buttonholes. 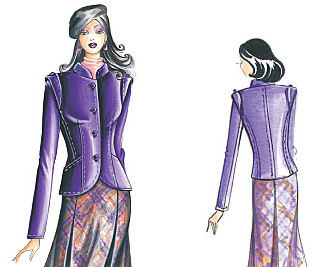 She used Roberta Carr's book "Couture..the Art of Fine Sewing" for reference. 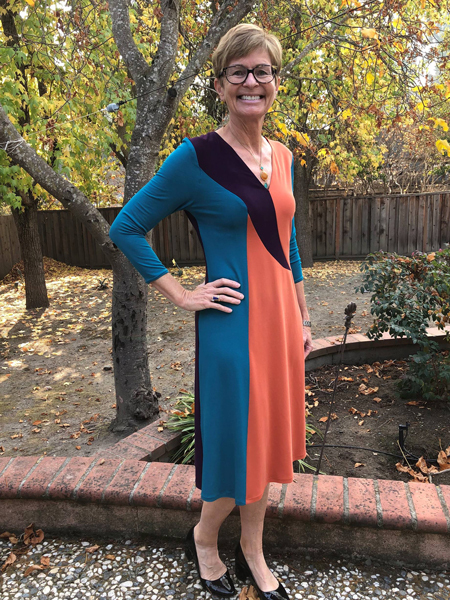 Kathy chose her first Marfy pattern to make this stunning dress. The fabric is a ponte knit from Stone Mountain and Daughters in Berkeley. 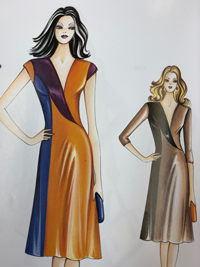 The Marfy 4009 dress pattern appears in the Marfy 2016-17 catalog. 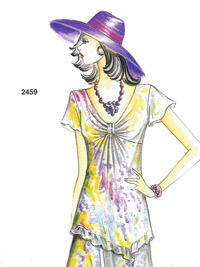 Kathy used the Marfy 4009 pattern for another dress in a palette complimentary to her coloring. 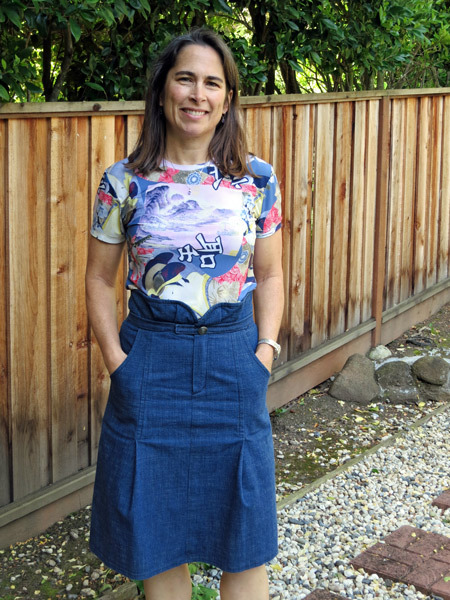 Lark's top is made with pattern 1707 by Marfy, and for the jeans she used Marfy 038. They are both beautifully made in harmonizing colors for Lark's coloring. 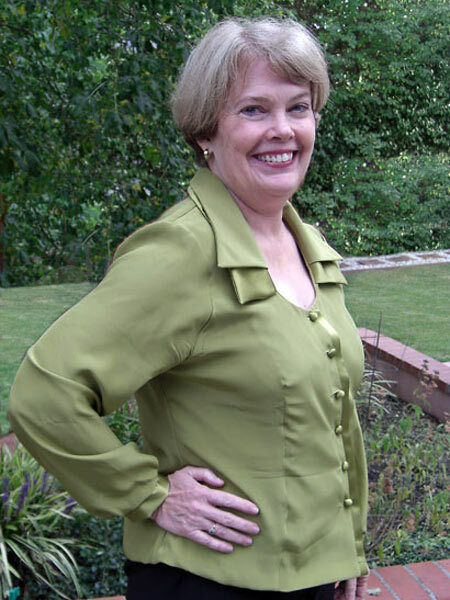 She used silk charmeuse for her blouse, and had a beautiful trim in her stash for the neckline. It matched her fabric perfectly. 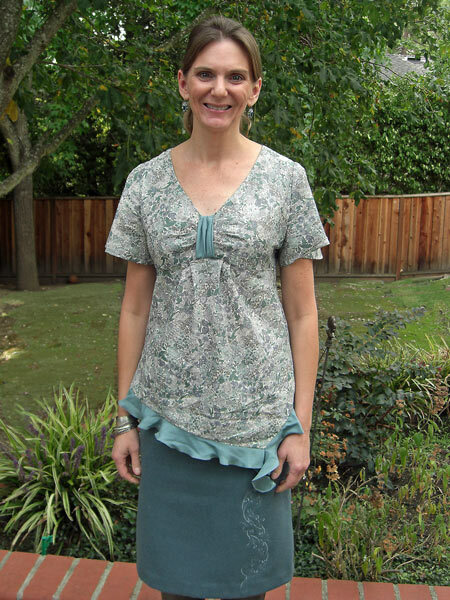 Katherine used a very pretty Liberty of London cotton gifted from her husband to make this Marfy blouse 2459. It's cut completely on the bias. She decided to trim it with a silk charmeuse in a soft teal color. This style is perfect for Katherine. Katherine found the wool in the "freebie" corner of Jane's studio. She embroidered the front and back with Jane's BERNINA machine. She didn't need a pattern, as Jane draped it around her!!! 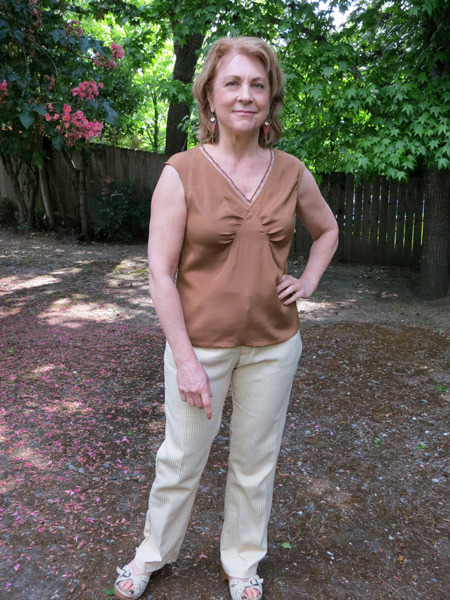 Kathleen chose a beautiful silk charmeuse for her blouse, and it was the first time she worked with this fabric and French seams. Great work Kathleen. 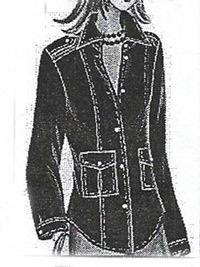 The front area by the buttons uses the satin side of the silk charmeuse as a design detail, and also to give just a bit more easy in the center front area. Kathleen attached the facing's satin side to the bodice front, and left it proud by pressing it 1/2 inch away from the seam. The two collars are different sizes, and are made separately and then attached together and sewn onto the neck opening. Jane says there is a fine line between under and over pressing silk charmeuse. Too much pressing would have ruined the shape of the collars. 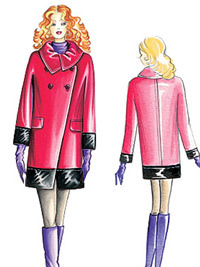 This Marfy 2467 pattern was a freebie with the Marfy pattern book. 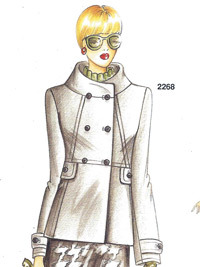 Another wonderful Marfy coat/jacket 2268. Jackie bought this pink fabric at JoAnn’s some years ago. 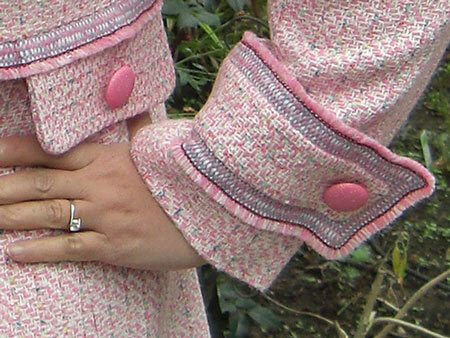 The jackets construction lines are very flattering and she has worked beautiful bound buttonholes. The selvage was so pretty she used it as a trim. Sally's skirt construction in the waistband area was a bit of a puzzle, and several construction routes were considered. 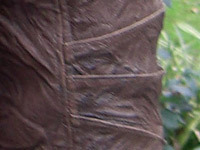 In the end it was solved by attaching the bottom of the belt in the waist seam. 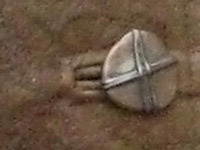 Hence it looks like a separate belt but in fact it is attached along the bottom. 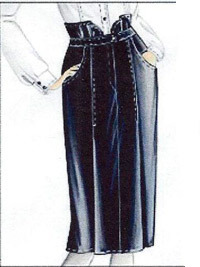 In checking with Marfy later, we found out they intended the garment to be constructed in this manner. 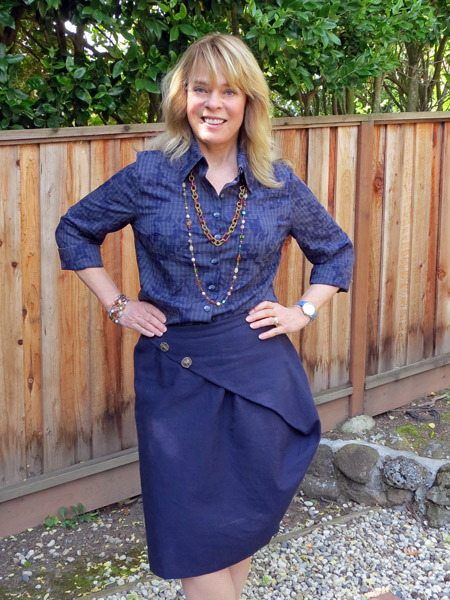 Sally used Marfy 1078 for this great jean skirt. 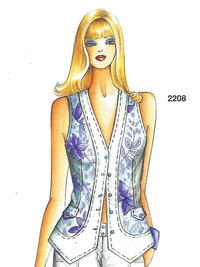 Some Marfy patterns come free with the catalogue, and Pat traced off the pattern 2208. She was lucky enough to find beautiful black wool melton and a cream and black tweed to make this vest in the "freebie" corner in Jane's studio. 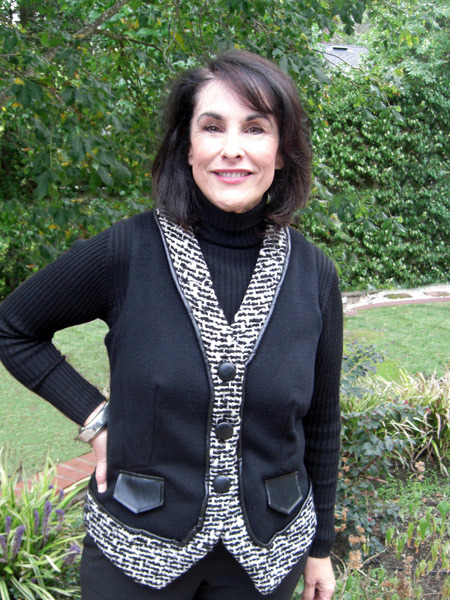 She bought lining and a faux leather trim and created this neat looking vest. Joy purchased this polka dot wool from a store in LA. . Using Marfy 2257, she has beaded the collar and made it her own. She is a whiz at Nuno felting, and used this method to make her collar and trims. 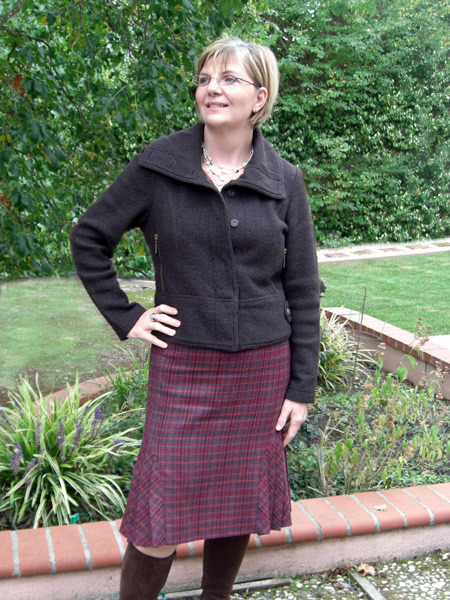 Vicki had fallen in love with her Marfy skirt pattern 9259 some years ago. She sketched and planned and discussed with Jane which fabric, which buttons, lining, buttonholes and the route map of construction with delight. Her final garment is a masterpiece inside and out. 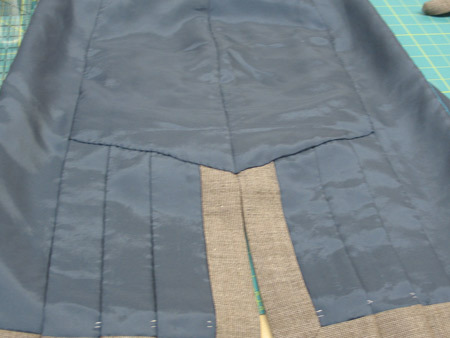 A lot of time and effort went into making the pleats. She basted everything as she went along so it would all be perfect. Its amazing to watch her sew!!! 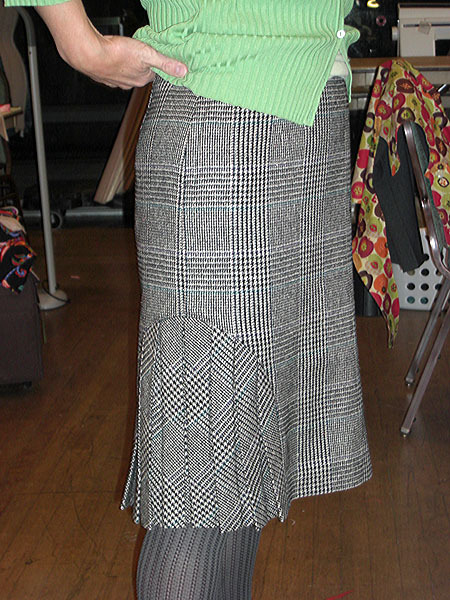 Vicki chose to completely line her skirt, and this added to the intricacy of the construction process. Notice there is also a slit. Vicki had her buttons covered in two colors of Ultra Leather by Pat Mahoney of Lodi, CA. She then made several samples of bound buttonholes with Ultra Leather, getting each buttonhole perfect before she moved on. 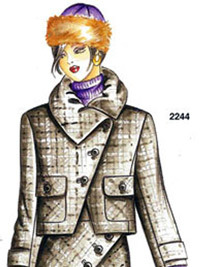 Like Janice, Maria also used Marfy jacket pattern 2270. As you can see, it looks just as wonderful in wool as in leather. The buttons were covered by our lady in Lodi, California and Maria’s bound buttonholes are exquisite. 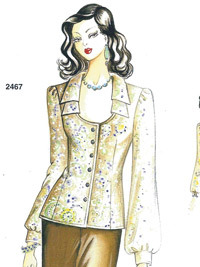 The jacket is lined with a patterned silk charmeuse. 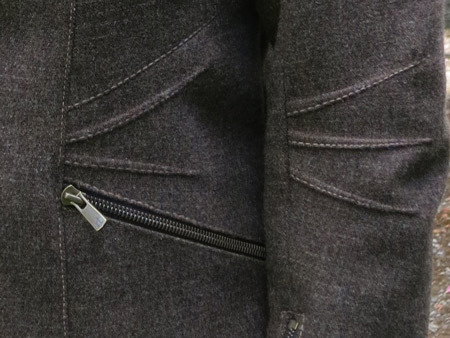 The detailing of the zippers and the top stitching really make this jacket stand out. 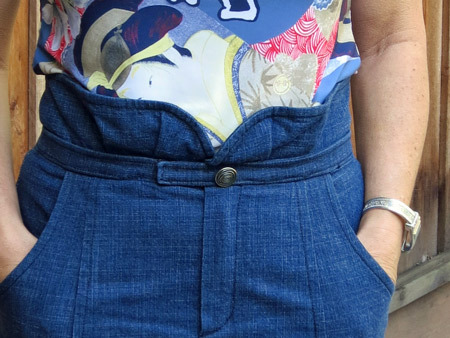 what a great design idea to sew darts on the inner elbow and on the right side. Yeah Marfy! 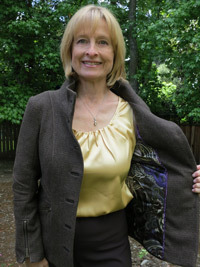 Maria worked on this Marfy jacket while she vacationed with Jane on her Fall 2011 Sewing Retreat. Now that it is completed, it is just stunning. 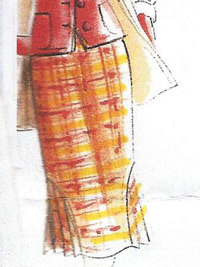 Barbara has known about Marfy patterns for years, and she remembers seeing catalogues for sale in Italian markets. She has made 2 skirts from the same Marfy pattern 1985. . And would you believe both of her beautiful pieces of wool came from Jane's freebie corner. The skirts look wonderful Barbara! 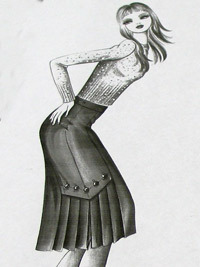 Barbara's second skirt was created from the same Marfy pattern 1985. 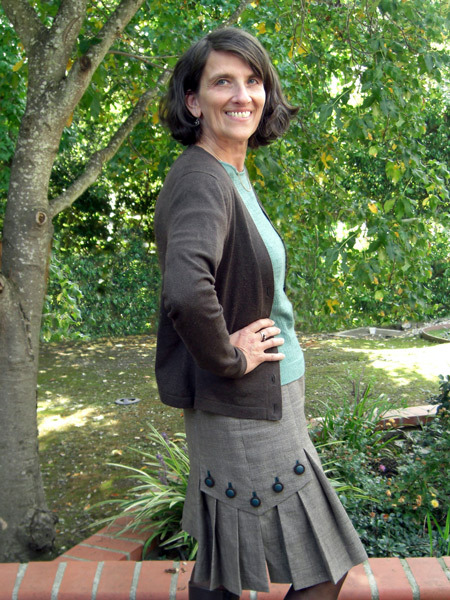 Ellen created this interesting skirt with Marfy pattern 2245. 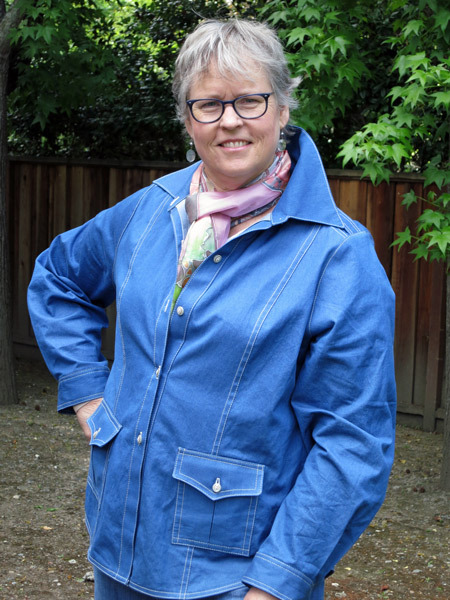 Vicki looks great in her denim shirt with perfect top stitching. She used Marfy pattern 9865 which she has had for some time. The buttons were purchased on her Paris trip. 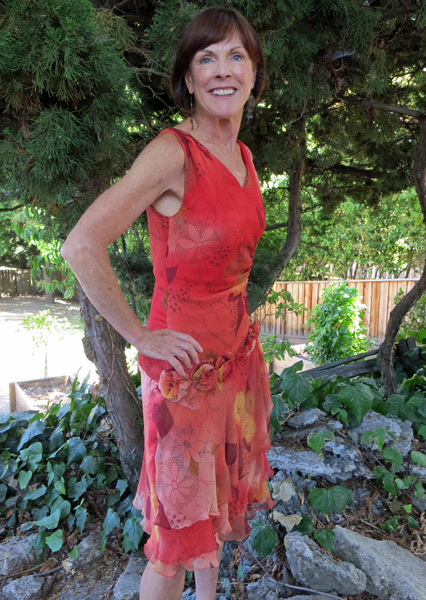 Jeanne made this stunning dress for a July wedding. 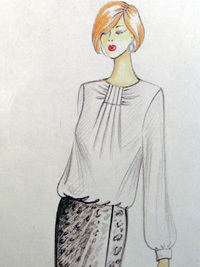 She found the printed silk chiffon at Britex, and lined it with a matching shade of china silk. 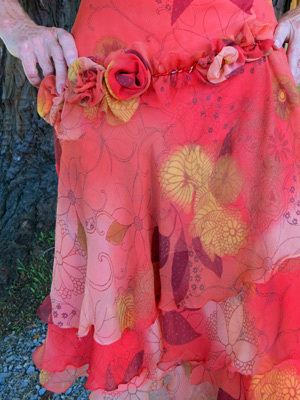 The Marfy pattern 2602 has a band of flowers, and she handmade her flowers and added beads. 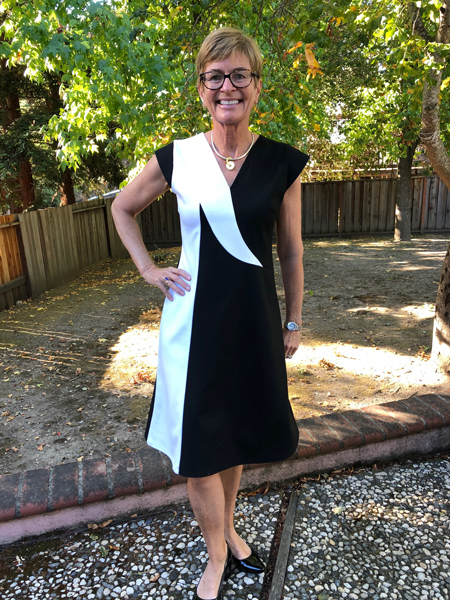 After making some samples, she hemmed the chiffon flounces by folding the fabric over once and working a very tiny zig-zag on and off the fold. Then the extra hem fabric is trimmed away from the wrong side. 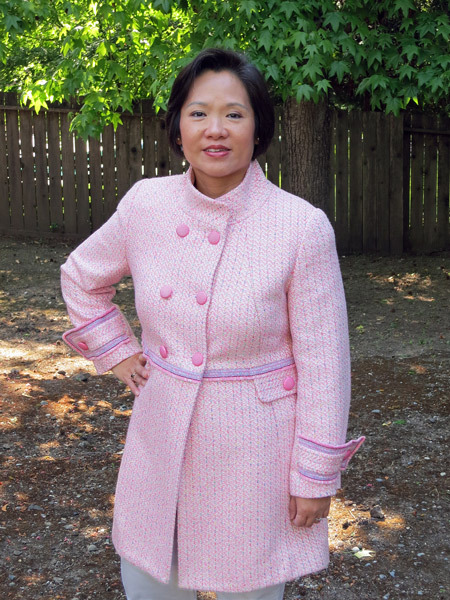 Thea looks fantastic in her new jacket created with Marfy pattern 2282. 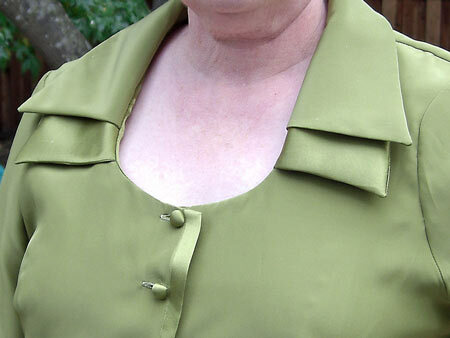 Her detailing includes bound button holes.